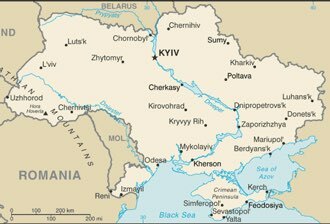 Ukraine : When and where to go? The country experiences a temperate continental climate, with significant differences between winter and summer temperatures. The Crimea, however, experiences milder winters. The best time to visit the country is June, but you can enjoy a pleasant climate between May and September. Kiev, the Ukrainian capital, is a must for any visitor: guardian of a rich history, dotted with invasions and marked by Orthodox traditions, it is home to a very important and exciting religious heritage, especially churches. But Kiev is also a city where the Dnieper flows, surrounded by many parks where even beaches are found in summer, and which is dotted with many shops and restaurants, especially on the main thoroughfare, Khreshchiatik Street. Another avenue where to stroll, Volodimirska street, leading from the Cathedral of St. Sophia to the Golden Gate, then to the opera and Shevchenko Park. Odessa, built in the 18th century on the shores of the Black Sea, also houses magnificent buildings, which is not surprising if we know that Catherine II, who was the origin of the city, wanted to make it A second St. Petersburg. Very sunny, it also offers pleasant beaches, beautiful shopping streets, and famous sites such as the famous Potemkin stairway, Catherine II square, the opera house, the archeology museum, and the town hall. Visit also the Crimea, the peninsula of the south of the country, with its steep cliffs and its many seaside resorts, but also its historical sites such as Soudak and its Genoese fortress, Bakhchissarai and its Khans palace, Yalta and its palaces. The region offers travelers beautiful landscapes, where sea and mountain meet and compete in beauty. Another very beautiful region is the Carpathians: a mountain range that is reminiscent of the Vosges, it lends itself especially to hiking, but one can also discover the old traditions of the country through a preserved folklore . There are also several ski resorts. A passport is sufficient if you stay less than 90 days in the country. The current currency is the hryvnia (UAH). By plane, you will arrive at the airport of Kiev-Boryspil, located 34 km from Kiev, which you can reach thanks to a shuttle (minibus). To travel in the country, the train is the most reliable means, and the prices are correct. There are also buses, providing connections between major cities. If you choose the car, be aware that the road network is in rather bad condition, except for the main roads. In Kiev, you will take the metro, or a taxi. Budget: life is much cheaper than in France, and you can eat in the restaurant for less than 10 €, and have a room in a hostel for a fortnight, and at the hotel for about 30 € . Health: In case of nature stay, it is prudent to be vaccinated against tick-borne encephalitis (present in the woods but also in the parks of Kiev). Up-to-date vaccinations against tuberculosis are also recommended. Security: Avoid using a credit card, situations of fraud are multiple. Moreover, despite the ceasefire proclaimed in February 2015, the situation remains tense throughout the eastern part of the country, in the Donbass area, in the Odessa region and more generally in the entire border area with Russia. It is highly unwise to visit these areas, as well as in the Crimea. Souvenirs to be brought from Ukraine: painted eggs from Lliv, woven belts, embroidered tunics, amber necklaces, carved wooden objects, naive paintings, pottery, wool blankets.